Background: This study intended to determine the effects of Vitamin D and calcium-Vitamin D in treating leg cramps in pregnant women. Materials and Methods: This study was conducted as a double-blind randomized controlled clinical trial on 126 participants, 18–35-year-old pregnant women with a minimum of two leg cramps per week who were referred to health-care centers in Tabriz-Iran in 2013. The participants were allocated to three 42 member groups using a randomized block design. For 42 days, the intervention groups took a 1000 unit Vitamin D pill or 300 mg calcium carbonate plus a 1000 unit Vitamin D pill, and the control group received a placebo pill every day. The participants were evaluated with regard to the frequency, length, and pain intensity of leg cramps during the week before and during the 3rd and 6th week of the intervention. The ANCOVA and repeated measurement test were used to analyze the data. Results: Results showed that controlling for the effects before the intervention, calcium-Vitamin D, and Vitamin D supplements had no effect on the frequency, length, and pain intensity of leg cramps. Conclusion: The results of this study showed that the calcium-Vitamin D and the Vitamin D supplements have no effect on the frequency, length, and pain intensity of leg cramps during the 6 weeks of the study. Muscle cramps are painful, local, tangible, and involuntary skeletal muscular contractions that usually affect leg muscles. Muscle cramps are one of the common symptoms of pregnancy, especially during the third trimester  that are often unidirectional. Leg cramps mostly happen twice a week or less frequently, usually at night,, last a few seconds to a few minutes, and mostly disappear by themselves. Cramps during pregnancy are not related to pregnancy complications and are not accompanied by undesirable consequences for the fetus, but the American Sleep Association considers leg cramps as one of the reasons for sleep disorders during pregnancy. Sleep disorder resulting from cramps influences performance of daily activities and may lengthen the duration of pregnancy and the type of childbirth., Moreover, the findings of studies have suggested that women with snoring in pregnancy have a higher risk for growth retardation of the fetus;, and women with sleep deprivation have a higher risk for preterm births. Various treatments have been suggested for preventing and curing leg cramps during pregnancy including taking Vitamins B1, B6, E, and C  and magnesium. The effects of the calcium supplement on improving leg cramps during pregnancy were investigated in many studies. Some of these studies reported relative or complete improvements of symptoms when calcium supplements were taken ,, while others stated these supplements were ineffective. Vitamin D is a fat-soluble vitamin found in very small quantities in natural food materials. Increased serum calcium improves metabolic and neuromuscular performance and bone health. Taking calcium supplement in food materials is necessary during pregnancy to prevent depletion of calcium in the mother's body. Furthermore, Vitamin D supplement  during pregnancy is necessary. Leg cramps are very prevalent in pregnant women and have negative influences on pregnant women's sleep performance and quality. Moreover, the mechanism of the effects of Vitamin D on calcium is not known and no study has been conducted on the effects of Vitamin D on leg cramps. Furthermore, Vitamin D is present in very quantities in food materials, vitamins are cheap, and pregnant women are very willing to take vitamins. That is why we decided to conduct a study on the therapeutic effects of Vitamin D and calcium plus Vitamin D supplement on leg cramps during pregnancy. This study was conducted as a double-blind randomized controlled clinical trial on pregnant women who were referred to health-care centers in Tabriz-Iran, 2013. A 18–35-year-old, being in 25th–30th week of pregnancy and having minimum of two cramps during the week. Exclusion criteria included history of chronic diseases, kidney problems, osteomalacia, active thyroid or parathyroid diseases, endocrine disorders, hypertension, use of diuretics, calcium-blockers intake, chronic hypertension, and history of allergy to the study supplements. Considering research carried out by Yaghmaei et al. and since α =0.05, β =0.02, m1 =49.17 (the overall mean score of cramp intensity before prevention), m2 =35 (the overall mean score of cramp intensity after the intervention), Sd1 =20.6, and Sd2 =23, the calculated number of participants for each group was 38. However, 42 participants were placed in each group to allow for dropouts. The tools used for collecting data included sociodemographic and midwifery questionnaires and checklists to record weekly information on leg cramps in the 3rd and 6th week of the intervention. The participants marked information on the frequency, intensity (in the Visual Analog Scale [VAS], graded from 0 to 10 with zero for lack of pain and ten for very severe pain, for each cramping event), length (in minutes), and the time leg cramps happened in the checklists during the 3rd and 6th week of the intervention. At the end of the 3rd and 6th week of the intervention, the participants marked the checklist table related to side effects of taking the Vitamin D and Vitamin D plus calcium supplements. Furthermore, to control for the potentially confounding factor of diet, a dietary record questionnaire including foods containing calcium and Vitamin D was also completed by the participants during 1 week before intervention. Sampling started after obtaining ethical code from the ethics committee of research and technology deputy of Tabriz University of Medical Sciences under the number 91230 and registering the trial in the IRCT website under the code IRCT2013040810324N12. Thirty-three health centers from various areas in Tabriz, with different sociocultural situations that were visited by the largest numbers of women were first selected from the total of eighty health centers in the city. Health centers in the country are public, nonreferral, and governmental that all primary care services, including prenatal care, are provided free of charge. The participants were selected by purposefully method sampling. A list of all pregnant women in their 25th–30th week of pregnancy who visited the selected centers was prepared. They were then contacted by telephone and invited to take part in the study. During their first visit to the center, the goals and method of the study were explained and the checklists for recording characteristics of leg cramps including the frequency, length, and intensity of leg cramps were given to them to record these during the week before the intervention started. At the end of this week, those who had recorded two and more cramps during the week and had other eligibility criteria entered the study and completed their informed written consent to participate in the research. The participants were allocated to three groups using a randomized block design with block sizes of three and six with the allocation ratio 1:1:1. To hide the allocation, each participant received two small envelopes, each with enough medicine for 3 weeks, inside a large matte-colored envelope of the same shape that were serially numbered. Each participant received one pill every day for 42 days. Pills containing Vitamin D (1000 units) or Vitamin D plus calcium complements (300 mg of calcium carbonate and 1000 units of Vitamin D) were of the same shape, size, and weight as the placebo pills. The pills were prepared by the Faculty of Pharmacy in Tabriz University of Medical Sciences, Iran. At the start of the intervention, each participant received a small envelope containing calcium plus Vitamin D or Vitamin D or the placebo, a checklist for recording leg cramp characteristics, and a checklist for recording daily multivitamins and pills taken during 3 weeks. They were asked to mark the checklists every time they took the pills. At the end of the 2nd week of the study, the participants were called and asked to record the characteristics of leg cramps during the third week in the related checklists. They were reminded to bring the medicine envelope and the checklist for leg cramps during the 3rd week and the checklist of medicines taken with them at the next follow-up that was at the end of the 3rd week. During this visit, each of the participants received a second envelope with the same content as the first, together with the checklists for the second 3-week period. At the end of the 5th week, the participants were called and reminded to record the characteristics of the leg cramps that happened during the 6th week in the related checklists. They were asked to bring these checklists and the checklists related to the medicines taken, together with the second envelopes, with them to the second follow-up visit at the end of the 6th week. The data were analyzed using SPSS/version 13 (SPSS Inc., Chicago). The K-S test was used to investigate the normality of the quantitative data. The variables of the length of cramps before the intervention, during the 3rd week of the intervention, and during the 6th week of the intervention were not normal. The variable of the number of cramps was considered as discrete variable. The Chi-square, Chi-square for trend, Fisher exact test, and one-way ANOVA were used to examine the consistency of study groups. To compare the average pain severity of leg cramps between three groups, repeated measures ANOVA was used after intervention with adjusting for basic score. The baseline (preintervention) value of pain severity as possible confounder factor was entered to repeated measures ANOVA model as covariate. Sidak test was used as post hoc test for pairwise comparisons. Kruskal–Wallis and Friedman tests were used, respectively, for inter- and intra-groups comparisons of the number and the length of leg cramps before, during the 3rd, and 6th after the start of the intervention. The power of repeated measures ANOVA test was equal with 0.74. 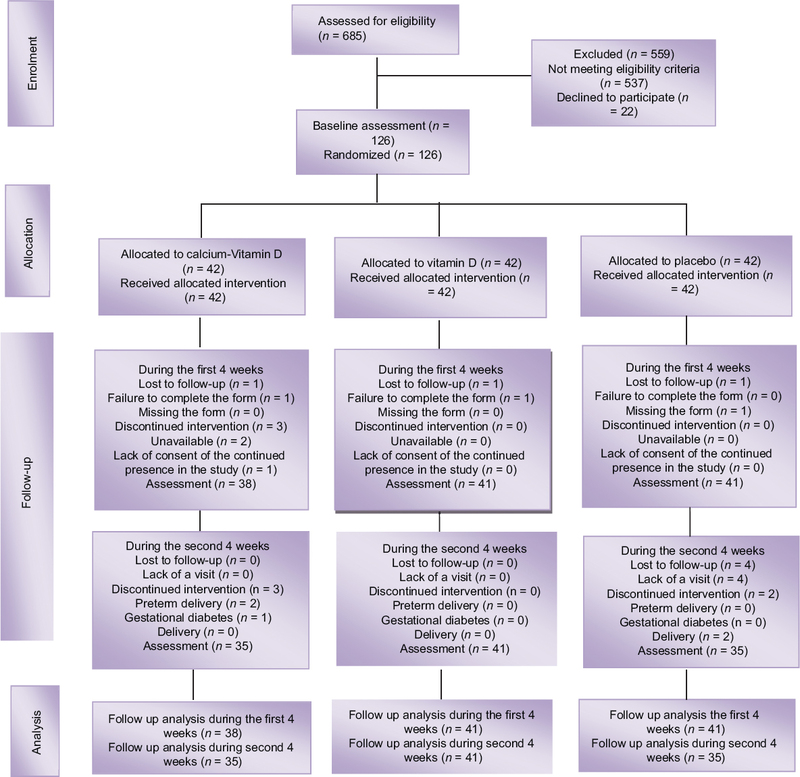 In this study, 126 pregnant women with leg cramps from July 2013 to January 2014 entered the study and their conditions were followed up to April 2014. The flowchart of this study was indicated in [Figure 1]. There were no statistical differences between groups regarding consuming of foods containing calcium and Vitamin D during 1 week before intervention (P = 0.204) and sociodemographic characteristics (P > 0.05) except of prepregnancy body mass index (BMI) (P = 0.024) and BMI during pregnancy (P = 0.008) [Table 1]. Before the intervention, there was no statistically significant difference between the groups in terms of length (P = 0.160) and pain severity of leg cramps (P = 0.990), but there was statistically significant difference between the groups in terms of weekly number of leg cramps (P = 0.012) [Table 2],[Table 3],[Table 4]. According to Kruskal–Wallis test, there was significant difference between the groups in terms of the weekly number of leg cramp during the 3rd week after the start of the intervention (P = 0.033) and the number of leg cramp was less in the control group. However, there was no significant difference between the groups during 6th week after the start of the intervention (P = 0.098) [Table 2]. Furthermore, there was no significant difference between the groups in terms of the length of leg cramps during the 3rd week (P = 0.308) and 6th week after the start of the intervention (P = 0.079) [Table 3]. In addition, the weekly number of leg cramp and the length of leg cramps were significantly decreased in each three groups according based on intra-groups comparison by Friedman test (P < 0.05) [Table 2] and [Table 3]. Based on the repeated measure ANOVA test with adjusting for baseline value, there was no statistically significant difference between the Vitamin D and control groups (P = 0.814), calcium-Vitamin D and control groups (P = 0.931), and also between two treatment groups (P = 0.993) [Table 4]. At the end of the 6 weeks, two participants in the group receiving calcium-Vitamin D, 13 in the group receiving Vitamin D, and six in the group receiving placebo reported itching. Furthermore, six participants in the group receiving calcium-Vitamin D, 14 in the group receiving Vitamin D, and six in the group receiving placebo reported they experienced dry mouth. Results of this research showed that the calcium-Vitamin D and Vitamin D supplements had no effect on the number, length, and pain severity in leg cramps during the 6 weeks of the study. Danesh Shahrakiconducted a study on three groups of pregnant women with leg cramps (who received calcium, Vitamin E, or magnesium milk) with no control group. They found that prescribing calcium carbonate at 500 mg/day for 45 days reduced the number, length, and pain intensity on the 45th day, but that on the 90th day after the first visit, these figures returned to their previous values. Their results are not consistent with those of the present study. Khoramroudi et al. observed that prescription of calcium at 500 mg/day for 40 days reduced the number of leg cramps but had no effect on pain intensity. Moreover, according to the study of Hammar et al. ( 1987), prescription of one gram of calcium for 2 weeks clinically improved leg cramps. Results of these two studies do not conform to those found in the present study, probably due to the difference in the doses of the prescribed medicines, and because calcium was used together with Vitamin D in our research. We suggest that future studies be carried out using higher doses to determine the effective one. According to the study by Zhou et al., there was no difference in the frequency of leg cramps after treatment with calcium versus Vitamin C. Since the control group received ascorbic acid in their study, and cramps improved relatively or completely in most participants. Thus, ascorbic acid may also be effective in treating muscle cramps. The results of systematic review by Young et al. showed that calcium can decrease pain in a leg cramps and it has positive effect on treatment. Furthermore, the results of Cochrane systematic review showed that a greater proportion of women receiving calcium supplements experienced no leg cramps after treatment than those receiving no treatment. This review suggested that large well-conducted randomized controlled trials are needed in this regard due to poor study design and small sample size of trials. The results of these reviews are not consistent with those of present study. The above-mentioned studies have assessed the effects of calcium on leg cramps but no studies have been conducted so far on the effect of Vitamin D supplement on cramps. However, calcium and bone metabolisms greatly depend on Vitamin D concentration and on its metabolically active form, 1,25(OH)2D, and the human body cannot absorb sufficient Ca and P without the help of 1,25(OH)2D. Moreover, the 1,25(OH)2D produced in the kidneys stimulate the calcium reserve in bone tissues and in the intestines and helps Ca and P absorption; and finally, the combination of these activities increases serum Ca and P. Increased levels of serum Ca and P cause improvements in metabolic performances, bone health, and neuromuscular functions. As Vitamin D and Ca had no effect on leg cramps in our study, and because the main reason for, and the mechanism of leg cramps in pregnancy are not clear yet, leg cramps during pregnancy may not be due to calcium deficiency and could have other causes. Lack of visual observation to investigate pain intensity in leg cramps was one of the limitations of this study. Furthermore, the impossibility of measuring blood calcium and Vitamin D levels was another limitation. It is recommended that future clinical trials should investigate the effects of Vitamin D and calcium-Vitamin D supplements with different doses of these materials, intervention should take place using a larger sample, and serum calcium and Vitamin D levels ought to be assessed to obtain results that are more accurate. Results of this study indicated that taking 1000 IU Vitamin D and 300 mg calcium plus 1000 IU Vitamin D every day for 6 weeks has no effect on leg cramps. One of the limitations in this study was the short follow-up period, so that a follow-up period longer than 6 weeks in the future researches was suggested. Furthermore, the serum levels of calcium and Vitamin D did not determined in this study due to cost restrictions. Therefore, these supplements should be administrated by assessing their serum levels before and after the intervention. This research was approved by the Regional Ethics Committee at Tabriz University of Medical Sciences with code number 91230. Furthermore, this article is a part of midwifery Master of Science thesis that registered in Iranian clinical trial center with code of IRCT2013040810324N12. Thanks to all who participated in this clinical trial, including Darou pakhsh Pharmaceutical Company, Iran. AM contributed in the conception of the work, conducting the study, drafting, and agreed for all aspects of the work. MM contributed in the conception of the work, conducting the study, analyzing the data, revising the draft, and agreed for all aspects of the work. SM contributed in the conception of the work, conducting the study, revising the draft, and agreed for all aspects of the work. MN contributed in the conception of the work, synthesis of drugs, revising the draft, and agreed for all aspects of the work. Young G. Leg cramps. BMJ Clin Evid 2008;26:1113. Hensley JG. Leg cramps and restless legs syndrome during pregnancy. J Midwifery Womens Health 2009;54:211-8. Valbø A, Bøhmer T. Leg cramps in pregnancy – How common are they? Tidsskr Nor Laegeforen 1999;119:1589-90. Sohrabvand F, Karimi M. Frequency and predisposing factors of leg cramps in pregnancy: A prospective clinical trial. Tehran Univ Med J 2009;67:661-4. Miller TM, Layzer RB. Muscle cramps. Muscle Nerve 2005;32:431-42. Parisi L, Pierelli F, Amabile G, Valente G, Calandriello E, Fattapposta F, et al. Muscular cramps: Proposals for a new classification. Acta Neurol Scand 2003;107:176-86. Pitkin RM. Endocrine regulation of calcium homeostasis during pregnancy. Clin Perinatol 1983;10:575-92. Salvatore CA. Leg cramp syndrome in pregnancy. Obstet Gynecol 1961;17:634-9. Nygaard IH, Valbø A, Pethick SV, Bøhmer T. Does oral magnesium substitution relieve pregnancy-induced leg cramps? Eur J Obstet Gynecol Reprod Biol 2008;141:23-6. Thorpy MJ. Classification of sleep disorders. Neurotherapeutics 2012;9:687-701. Lee KA, Gay CL. Sleep in late pregnancy predicts length of labor and type of delivery. Am J Obstet Gynecol 2004;191:2041-6. Micheli K, Komninos I, Bagkeris E, Roumeliotaki T, Koutis A, Kogevinas M, et al. Sleep patterns in late pregnancy and risk of preterm birth and fetal growth restriction. Epidemiology 2011;22:738-44. Franklin KA, Holmgren PA, Jönsson F, Poromaa N, Stenlund H, Svanborg E. Snoring, pregnancy-induced hypertension, and growth retardation of the fetus. Chest 2000;117:137-41. Sohrabvand F, Shariat M, Haghollahi F. Vitamin B supplementation for leg cramps during pregnancy. Int J Gynaecol Obstet 2006;95:48-9. Danesh Shahraki A. Effect of Vitamin E, calcium carbonate and milk of magnesium on muscular cramp in pregnancy t women. J Med Sci 2006;6:979-83. Zhou K, West HM, Zhang J, Xu L, Li W. Interventions for leg cramps in pregnancy. Cochrane Database Syst Rev 2015;8:CD010655. doi: 10.1002/14651858.CD010655.pub2. Young GL, Jewell D. Interventions for leg cramps in pregnancy. Cochrane Database Syst Rev. 2002;(1):CD000121. Hammar M, Berg G, Solheim F, Larsson L. Calcium and magnesium status in pregnant women. 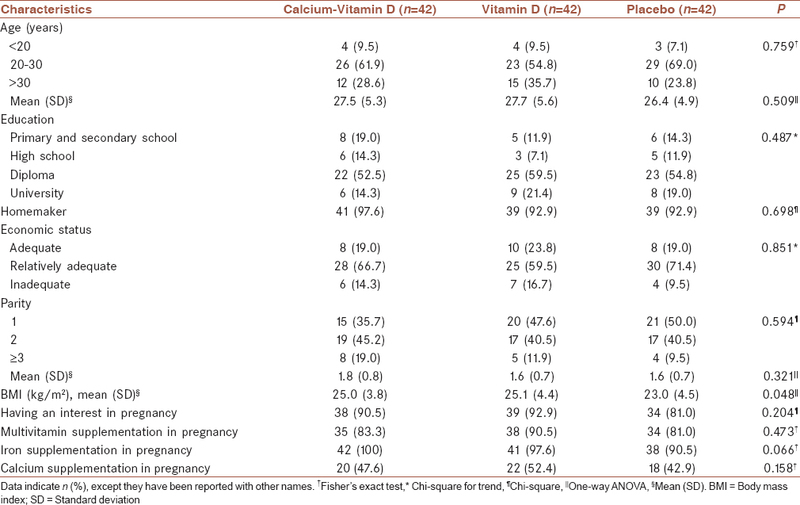 A comparison between treatment with calcium and Vitamin C in pregnant women with leg cramps. Int J Vitam Nutr Res 1987;57:179-83. Holick MF. Vitamin D: A D-Lightful health perspective. Nutr Rev 2008;66 10 Suppl 2:S182-94. Cunningham FG, Leveno KJ, Bloom SL, Hauth JC, Rouse DJ, Spong CY. et al. Williams Obstetrics. 23rd ed. New York: McGraw-Hill; 2010. Salle BL, Delvin EE, Lapillonne A, Bishop NJ, Glorieux FH. Perinatal metabolism of Vitamin D. Am J Clin Nutr 2000;71 5 Suppl: 1317S-24S. Yaghmaei M, Mokhtari M, Mohammadi M. Effect of combination of Vitamin B1 and B6 on leg cramps in pregnancy. J Shahrekord Univ Med Sci 2006;8:63-9. Zarei S, Mohammad-Alizadeh-Charandabi S, Mirghafourvand M, Javadzadeh Y, Effati-Daryani F. Effects of calcium-Vitamin D and calcium-alone on pain intensity and menstrual blood loss in women with primary dysmenorrhea: A randomized controlled trial. Pain Med 2016. Pii: pnw121. Khoramroudi R, Norouzi A, Jamand T, Tahmasebi R, Akaberian SH, Hefzollah A. et al. Comparative study of calcium efficacy and placebo on leg muscle cramps during pregnancy in patients referred to clinics supervised by Bushehr University of Medical Sciences. Iran South Med J 2011;14:185-92. Kovacs CS. Vitamin D in pregnancy and lactation: Maternal, fetal, and neonatal outcomes from human and animal studies. Am J Clin Nutr 2008;88:520S-8S.